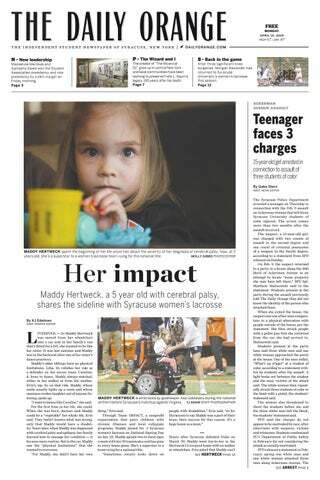 The Daily Orange is an independent newspaper published in Syracuse, New York. The editorial content of the paper â&#x20AC;&#x201D; which originated in 1903 and went independent in 1971 â&#x20AC;&#x201D; and its online platforms are entirely run by Syracuse University students. The D.O.â&#x20AC;&#x2122;s coverage of the Syracuse area is disseminated through 87 issues during the 2018-19 academic year with a circulation of 750,000 copies and a readership of 30,000. The paper is published Sunday, Tuesday and Thursday when SU classes are in session. Special inserts are published on Thursdays before home football games and select basketball games and in the cases of notable and newsworthy occasions. 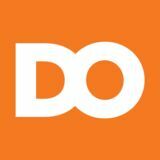 The D.O.â&#x20AC;&#x2122;s online coverage is 24/7, including while SU is on break. To show your support to The D.O.â&#x20AC;&#x2122;s independent journalism, please visit dailyorange.com/donate. # Scan this code to subscribe to a weekly slice of Syracuse. Here are three Syracuse news stories you may have missed from over the weekend. Brandon Steiner, founder and chairman of Steiner Sports Marketing, will speak at the David B. Falk College of Sport and Human Dynamics’ convocation in May, according to an SU News re-lease. Steiner graduated from Syracuse University in 1981 and serves as the chairman of Falk College’s Sport Management Advisory Board. Steiner Sports has partnerships with the New York Yankees, SU Athletics, Notre Dame Football and Madison Square Garden, according to the release. He frequently comments on sports during radio shows and also contributes to multiple charities, per the release. were surprised by the results, but added that it means they ran a great race. “It’s really awesome that there was such huge competition between the candidates because usually everyone knows who’s going to win,” Mertikas said. Their first step as leaders-elect be to have a discussion with SA about respect and accountability, they said. “We want to make sure they know we are in these positions to help the student body and make their experience better here on campus. We’re here for them and not for ourselves,” they said. Mertikas and Saied are most excited about meeting more people because they have already talked to many organizations so far during the campaign, they said. Current SA President Ghufran Salih and Vice President Kyle Rosenblum attended the party to congratulate the winning candidates. A 16-year-old boy was stabbed on Friday afternoon in Syracuse, according to the Syracuse Po-lice Department. Witnesses said the boy was stabbed near the 800 block of Park Street, per a statement from SPD. He received a non-life threatening stab wound, per the statement. The boy was transported to Upstate Hospital. The suspect is an unknown man, according to the statement. Suspect information is limited, and the investigation is ongoing, per to the statement. Bringing you the stories of central and northern New York for 50 years, thanks to listener and business support. gun laws and support for communities, residents are vulnerable to the same mental illnesses as school shooting survivors, including PTSD, anxiety and depression. In order to solve the multifaceted issue of gun violence in urban areas, there needs to be both communityand policy-level solutions. And while gun regulations remain a lively topic of debate, the country is slow to make changes. In the meantime, we can focus on supporting those in our own community impacted by gun violence. Programs like Street Addiction Institute that provide opportunities for at-risk youth, have the power to stop the cycle of gun violence by responding to the trauma that witnesses of violence face. Madeline Johnson is a sophomore international relations and magazine journalism major and a Spanish minor. Her column appears bi-weekly. She can be reached at mjohns38@syr.edu and followed on Twitter @johnson_madeli. chemicals, carcinogenic chemicals, heavy metals and diacetyl chemicals which are linked to many lung diseases. JUULs and e-cigs are dangerously popular on college campuses, like SU. JUULing has become a fad throughout youth in America. It’s obvious how popular it is when it’s constantly all over social media outlets like 5th Year and Barstool Sports. Millions of college students follow these accounts and are exposed to their content on a daily basis. JUULing is often portrayed on these accounts as something popular and cool, which makes many young kids want to partake in it. Organizations like the Food and Drug Administration need to take more action to promote the dangers of these e-cigs and remove them from the market or tax them more to prevent further use. 00ì0)88)67ì;-00ì&)ì)(-8)(ì*36ì78=0)ì and grammar ,%2/ì=39ì-2ì%(:%2')ì*36ì following these guidelines. lthough the majority of the weather here in Syracuse is cold year-round, it’s still very important to stay hydrated and drink plenty of water. Water is your best friend in college. The human body is made up of 60% water and therefore it’s essential we drink plenty of water every day. Water serves many purposes in the body and serves various benefits, especially for student brains. It’s proven that when we are thirsty, it’s a lot more difficult to keep our attention focused on our studies because according to Psychology Today, “dehydration can impair short term memory function and the recall of long term memory.” Drinking water improves brain function, which is an important factor for student success. According to a research study, “college students who drank water during exams received better grades due to the physiological effect on thinking functions and alleviation of anxiety.” This serves as a great example as to why there should be water fountains (preferably the automatic ones) on every floor in the dorms here at Syracuse University. For the sake of the environment and college student budgets, it’s not ideal to purchase and drink plastic water bottles. If water fountains were installed on every floor in the residence halls then students would be more inclined to use reusable bottles, therefore saving money and helping the environment. Not only do SU students study hard, but they also tend to party hard. Alcohol is a diuretic which means that it creates increased urine production and then can lead to dehydration. The importance of drinking water while consuming alcohol or after a night out is imperative to replenish the body and cure a hangover. Therefore, we should make it a priority to have easy access to water for students at all times. I believe our pricey tuition should be spent toward features such as this, especially because the dorms are very old. Staying hydrated at all times is imperative to thrive here at SU. range of things that people might be struggling with. People who have strep throat or have the common cold often look to their doctor to get medicine immediately, but when it comes to mental health, we decide to wait until the person is at their absolute worse before someone decides to treat them. Mental health affects millions of people here in the United States from all age ranges, yet it’s continuously pushed to the side and is both treated and seen as a daily emotional struggle rather than an illness. By promoting the idea of implementing mental health evaluations in addition to yearly physicals, it might become less taboo for individuals in our society to ask for help and rather just another part of their routine checkup. solo, which is unusual, she said, considering that she has her own band. The group, “Rebecca Colleen and the Chore Lads,” regularly plays shows throughout the Finger Lakes region, performing at wineries, festivals, music series and other events. Splitting time with two other musicians makes preparation difficult, Zane said. Each performance will be limited to about 30 minutes, he added, so he had to pick the six or seven songs he likes most — making him abandon some songs that he said are worthy of unveiling. former Chittenango village librarian, organized a small birthday party for Baum, where locals sang “Happy Birthday,” ate cake and ice cream and read part of the first book in the series. It then graduated into the Oz-Fest and became Oz-Stravaganza in 2008. Always held the first weekend in June, OzStravaganza can attract up to 35,000 people to celebrate “The Wizard of Oz.” Six years ago, the group became a government-recognized 501(c)3 historical foundation and opened its museum, which has a collection of more than 15,000 pieces and saw 18,000 visitors last year. Live the dream. NO FEE MANHATTAN APARTMENT RENTALS in New York’s best neighborhoods. FOR SALE • BRICK RANCH-STYLE HOUSE IN DEWITT Charming brick house on quiet street in Dewitt School District. Convenient to Syracuse University, hospitals, and downtown. Mature landscaping, lovely three-season porch with jalousie windows and screens which overlooks a private, partially fenced backyard with many perennials. Inside are a foyer, large living room with hardwood floors covered by carpet, a woodburning fireplace, dining L, two large bedrooms and two full baths, kitchen with refrigerator, washer, dryer, and eating area. In the basement are a bedroom with a half bath, a study, a paneled recreation room, a freezer, and a storage room with an elaborate system of shelves. Asking $169,000. Location: 109 Humbert Avenue, Syracuse, NY 13224. For sale by owner. Viewing by appointment only. Telephone: 315.446.4138. STUDY ONLINE OR ONSITE AT GCC  Get prerequisites out of the way  Lighten your fall semester course load  Get ahead on your degree program  Maintain your Excelsior Scholarship!  GCC offers 120 summer courses more than 50 online! Genesee Community College is an equal opportunity/affirmative action institution. LEASE TODAY LEASE LAST CHANCE TOTODAY LEASE TODAYAvailable June RENT FROM BEN!LEASE TODAY LEASE on Ackerman Ave. TO LEASE TODAY LEASE only a few left for 2019-2020 academic year! Great 5,6,7 Bedroom House LEASE Rates as low as LSE $940 per month TAY Fireplace, ADT Alarm Euclid, Sumner, AckermanTODAY Lots of parking 2,3,4 bedroom apartments and flatsLEASE TODAY LEASE Pet friendly, laundry on premises, TODAY LEASE TODAY Great porch furnished, off street parking. Available Commencement Luxury Suite: Host family in style before, during, after commencement ceremony. 3 party rooms for up to 400 guests with free parking! LADIESDAY EVERY TUESDAY 1/2 price food all day long, including wings, burgers, eggplant! Men and women. Meet new friends! Travel! Teach your favorite activity. he pain was instant. The swelling followed soon after. Morgan Alexander had planted awkwardly during a 1-on-1 drill and fallen to the turf at Ensley Athletic Center. As she looked down, she noticed her knee cap was perpendicular to its normal placement. Tears flowed down her face. Kathleen Chaney, the Syracuse women’s lacrosse team’s associate athletic trainer, ran to Alexander’s side and threw a raincoat over her leg. With help from a few coaches, she got Alexander onto a cart and on her way to the hospital.